The Vuelta a España’s return to the Basque Country for the first time in 33 years was greeted by a victory from local rider Igor Antón (Euskaltel-Euskadi). The 28-year-old from Galdakao, close to the base of final climb of the Alto El Vivero on the outskirts of Bilbao, won the stage after being a member of the long break of the day. Since an overall victory in the Vuelta was his primary objective of the season though, Antón had hoped to be arriving in the Basque capital under different circumstances. Antón found himself struggling immediately the race hit the mountains on stage four. He surprisingly lost 1’27” to the other overall hopefuls on the climb to Sierra Nevada, then lost some more on the short climb to Valdepeñas de Jaén the next day. In recent stages his form has improved, but it was all too late for the overall classification. “The uphill finishes at the Angliru and Peña Cabarga brought my morale back to the top and I got to believe that I could do well here, but I don’t know where I’ve found the strength to win,” he said. “Yeah, I understand that I owe it to the fantastic job of my team-mate Gorka Verdugo and the unbelievable support from the crowd. The climb of El Vivero is my daily bread at training. On the climb to El Vivero for the first time Antón appeared to exchange words with some of the hordes of Basque fans that lined the roads in a way reminiscent of the Pyrénéen climbs in the Tour de France. 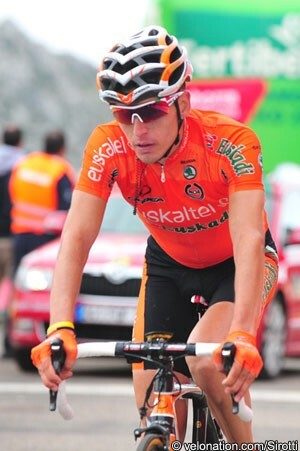 The Vuelta is Antón’s second Grand Tour of 2011, having ridden the Giro d’Italia back in May. Although he ignored the overall classification and merely fulfilled his mission of taking a stage victory, like many others who rode the race he has had problems reaching top form for another three-week race. “It’s one of the factors,” he admitted. “After the Giro, I took a rest but I maybe resumed training before I’d recovered 100% of my capacities and I got food poisoning. It might have affected my training for the Vuelta. I reproduced the training plans that worked last year, but cycling isn’t an exact science. Although much of the race has not gone to plan for Antón, he will still very likely return to the Vuelta next year, particularly following his emotional in his home town. “I’ll have to look at the course first, but this is a race for me,” he declared. “Every year that ends with an even number, I normally do well: in 2006, I won stage 16 to Calar Alto; in 2008, I was on the edge of making the final podium when I crashed; in 2010, I won two stages before I crashed with the red jersey on my shoulders. This year, I’m having my apprenticeship for suffering and I hope to come back in 2012 on the right path and race for the overall win or the podium. I dream of it but this is only sport, after all.